“Perhaps the work may be too difficult for a child to manage.” Having now experienced this pattern in its entirety, I wish to ally myself with those sentiments. Actually, I wish to rip the editor from his tomb and scream, “No sh-t, Sherlock!” into whatever remains of his ear. But Knitty is a genteel publication and wouldn’t appreciate that sort of behavior. It is not, dear reader, that the knitting itself is particularly complicated. Take the lace edgings, for example. There are two of them, one large and one small. The small edging is a variation of the large edging. The large edging is designed with such a logical progression of rows that after one repeat I had it committed to memory. Simple. Learn one, and you've learned both. No, it’s not that the edging is complicated, it’s just that there’s eight @#$! * feet of it. Eight. Feet. That’s 2.4384 meters, for metric types. However you measure, that’s a whole lot of lace to wrap around a doll that doesn’t reach my knee, and my knee isn’t that far off the ground, even when it’s Giselle night and I’m en pointe. So, listen. 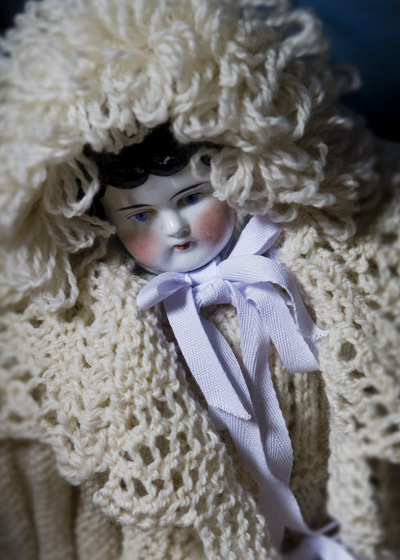 If it so happens that you are a mother, aunt or kind friend who would delight in dressing such a doll for a present, and you would like to deliver that present on (to pluck a date from the air) 25 December 2011, stop reading and cast on now. NOW! Because these wee widdle baby clothes are not of the kwik-n-kute variety. 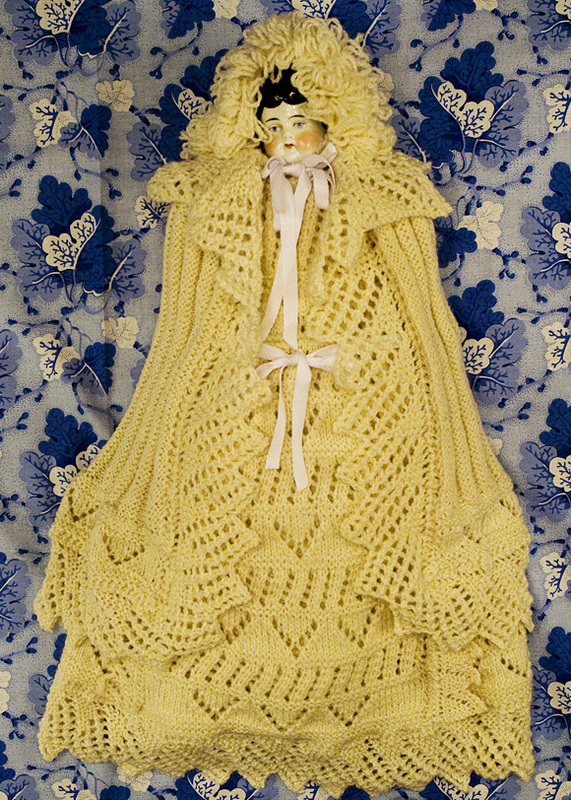 The robe is 36 inches around at the hem, and that hem must be edged with three of the eight feet (2.4384 meters) of lace. They’re pretty, I’ll give you that, in a why-dress-the-baby-when-we-can-upholster-it kind of way. And it takes a sturdy doll to wear them. They’d crush an American Girl like a grape. Poor, tiny Ethel ultimately proved unequal to the task,* and handed the wardrobe over to her bigger sister, Clarissa. The project was in its final stages when I spotted Clarissa in an antiques mall in Seattle, shamefully attired in a thrift-shop Steampunk déshabille consisting of a flimsy black tulle tutu and a strand of fake seed pearls. Of course, winter’s coming and now I’m going to have to knit something for Ethel. * If you want a smaller ensemble, use smaller yarn and/or smaller needles. Change the gauge, change the size. Weldon’s wouldn’t mind, seeing as they didn’t bother to specify a gauge in the first place. 24 sts/48 rows = 4 inches in garter stitch with larger needles. Instructions for single crochet and crochet chains can be found here. SKP: Slip next st as if to knit, k1, then pass slipped st over st just knit. Looped Knitting: With working yarn in right hand, wrap yarn around the tips of the first two fingers of the left hand and the tip of the right needle, held together; then wrap the yarn once more over the tip of the right needle only. With the tip of the right needle, pull all four wraps through the stitch on the left needle, and slide that stitch off the needle. Using larger needle, CO 11 sts. Row 1 [RS]: Sl 1 as if to p wyif, k2tog, yo, k1, [yo, k2tog] 3 times, yo, k1. 12 sts. Rows 2, 4, 6, 8, 10 [WS]: Knit. Row 3 [RS]: Sl 1 as if to p wyif, k2tog, yo, k2, [yo, k2tog] 3 times, yo, k1. 13 sts. Row 5 [RS]: Sl 1 as if to p wyif, k2tog, yo, k3, [yo, k2tog] 3 times yo, k1. 14 sts. Row 7 [RS]: Sl 1 as if to p wyif e, k2tog, yo, k4, [yo, k2tog] 3 times, yo, k1. 15 sts. Row 9 [RS]: Sl 1 as if to p wyif, k2tog, yo, k5, [yo, k2tog] 3 times, yo, k1. 16 sts. Row 11 [RS]: Sl 1 as if to p wyif, k2tog, yo, k6, [yo, k2tog] 3 times, yo, k1. 17 sts. Row 12 [WS]: BO 6, k to end. Repeat Rows 1–12 to desired length. BO. Using larger needle, CO 7 sts. Row 1 [RS]: Sl 1 as if to p wyif, k2tog, yo, k1, yo, k2tog, yo, k1. 8 sts. Row 3 [RS]: Sl 1 as above, k2tog, yo, k2, yo, k2tog, yo, k1. 9 sts. Row 5 [RS]: Sl 1 as above, k2tog, yo, k3, yo, k2tog, yo, k1. 10 sts. Row 7 [RS]: Sl 1 as above, k2tog, yo, k4, yo, k2tog, yo, k1. 11 sts. Row 9 [RS]: Sl 1 as above, k2tog, yo, k5, yo, k2tog, yo, k1. 12 sts. Row 11 [RS]: Sl 1 as above, k2tog, yo, k6, yo, k2tog, yo, k1. 13 sts. Row 12 [RS]: BO 6, k to end. Repeat Rows 1-12 to desired length. BO. With larger circular needle, CO 80 sts. Join for working in the round, being careful not to twist. Place a marker for start of round. Round 2: [Yo, k2tog] around. Round 4: K17, BO 6, k until you have 34 sts on right needle after BO, BO 6, k to end of round. Round 5: K to first gap, CO 6 sts over gap, k to next gap, CO 6 sts over gap, k to end of round. 80 sts. The pattern for these two pieces of the ensemble can be found in the first part of this feature, here. Bodice round: [K2, p2] around. Work ribbing as set for 4 inches. Eyelet round for waist tie, and increase for skirt: [K1, yo] around. 160 sts. Rounds 1-4: [K4, p4] around. Rounds 5-8: [P4, k4] around. Repeat Rounds 1–8 until skirt measures 9 inches (approximately 88 rounds) from eyelet round. Optional (but historically accurate): Work one round of single crochet around each armhole. Knit a length of Edging A sufficient to trim lower edge of skirt. BO. Weave in ends. Sew lace edging to hem of skirt. 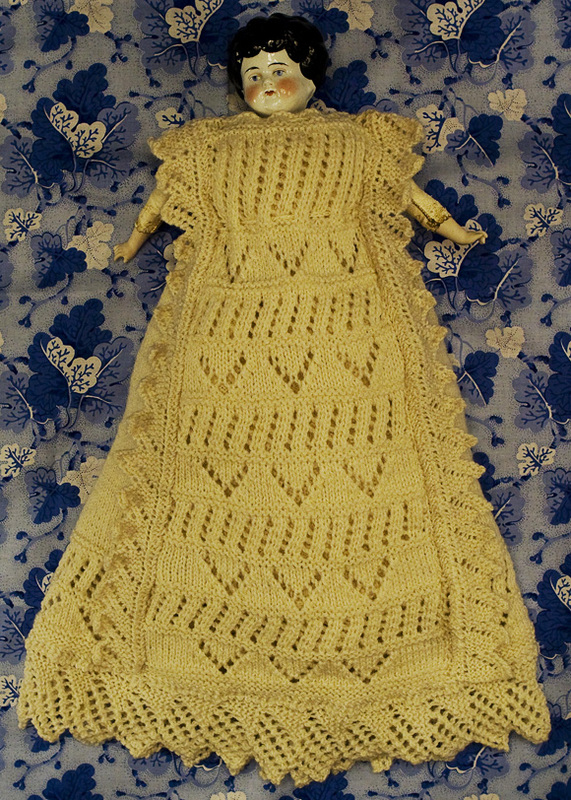 Crochet two lengths of 20-inch chain and thread through eyelet rows at neck and waist; tie in back. Using larger needle, CO 50 sts. Row 1 [RS]: K12, [SKP, yo, k2tog, k7] twice, SKP, yo, k2tog, k12. 47 sts. Row 3 [RS]: K11, [SKP, yo, k1, yo, k2tog, k5] 3 times, k6. Row 5 [RS]: K10, [SKP, yo, k3, yo, k2tog, k3] 3 times, k7. Row 7 [RS]: K9, [SKP, yo, k5, yo, k2tog, k1] 3 times, k8. Row 12 [WS]: K to last 2 sts, k2tog. 46 sts. Row 13 [RS]: Sl 1, [yo, k2tog, k1] to end. Repeat Rows 13-14 3 more times. Row 25 [RS]: K10, [SKP, yo, k2tog, k7] twice, SKP, yo, k2tog, k10. 43 sts. Row 27 [RS]: K9, [SKP, yo, k1, yo, k2tog, k5] 3 times, k4. Row 29 [RS]: K8, [SKP, yo, k3, yo, k2tog, k3] 3 times, k5. Row 31 [RS]: K7, [SKP, yo, k5, yo, k2tog, k1] 3 times, k6. Row 36 [WS]: K to last 2 sts, k2tog. 42 sts. Row 37 [RS]: Sl 1, [yo, k2tog, k1] to last 2 sts, yo, k2tog. Repeat Rows 37-38 3 more times. Row 49 [RS]: K8, [SKP, yo, k2tog, k7] twice, SKP, yo, k2tog, k8. 39 sts. Row 51 [RS]: K7, [SKP, yo, k1, yo, k2tog, k5] 3 times, k2. Row 53 [RS]: K6, [SKP, yo, k3, yo, k2tog, k3] 3 times, k3. Row 55 [RS]: K5, [SKP, yo, k5, yo, k2tog, k1] 3 times, k4. Row 60 [WS]: K to last 2 sts, k2tog. 38 sts. Row 61 [RS]: Sl 1, [yo, k2tog, k1] to last 4 sts, [yo, k2tog] twice. Repeat Rows 61-62 3 more times. Row 73 [RS]: K6, [SKP, yo, k2tog, k7] twice, SKP, yo, k2tog, k6. 35 sts. Row 75 [RS]: K5, [SKP, yo, k1, yo, k2tog, k5] 3 times. Row 77 [RS]: K4, [SKP, yo, k3, yo, k2tog, k3] 3 times, k1. Row 79 [RS]: K3, [SKP, yo, k5, yo, k2tog, k1] 3 times, k2. Row 84 [WS]: K to last 2 sts, k2tog. 34 sts. Row 85 [RS]: Sl 1, [yo, k2tog, k1] to end. Repeat Rows 85-86 3 more times. Row 97 [RS]: K4, [SKP, yo, k2tog, k7] twice, SKP, yo, k2tog, k4. 31 sts. Row 99 [RS]: K3, [SKP, yo, k1, yo, k2tog, k5] twice, k to end. Row 101 [RS]: K2, [SKP, yo, k3, yo, k2tog, k3] twice, k to end. Row 103 [RS]: K1, [SKP, yo, k5, yo, k2tog, k1] 3 times. Row 108 [WS]: K to last 2 sts, k2tog. 30 sts. Row 109 [RS]: Sl 1, [yo, k2tog, k1] to last 2 sts, yo, k2tog. 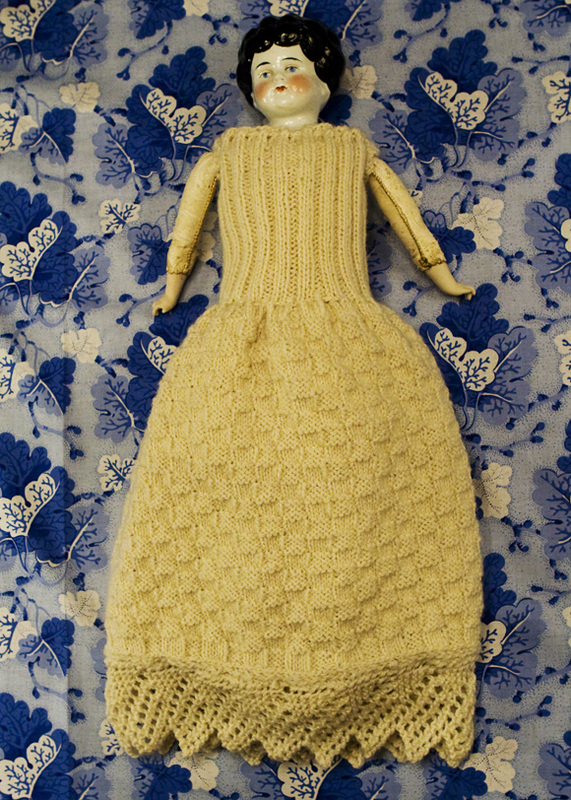 Repeat Rows 109-110 until this section of the front equals 5 inches, or length of the doll’s body from doll’s hips to just below shoulder. End with a WS row. Put a safety pin in the fabric at the end of this row. Next row [RS]: K3, [yo, k2tog, k1] across. Row 3 [RS]: Sl1 , yo, k2tog, k1, turn. Rows 5-8: K4. BO those 4 sts. Next row [RS]: Join yarn where you left off and BO until 4 sts rem total. K to end of row. Work Rows 3-8 as above. Using larger needle, CO 139 sts. Row 6 [RS]: K7, [SKP, yo, k2tog, k7] to end. 127 sts. Row 8 [RS]: K6, [SKP, yo, k1, yo, k2tog, k5] to last st, k1. Row 10 [RS]: K5, [SKP, yo, k3, yo, k2tog, k3] to last 2 sts, k2. Row 12 [RS]: K4, [SKP, yo, k5, yo, k2tog, k1] to last 3 sts, k3. Row 17 [WS]: K to last 2 sts, k2tog. 126 sts. Row 18 [RS]: [Sl 1, yo, k2tog, k1] to last 2 sts, yo, k2tog. Repeat Rows 18-19 3 more times. Work in plain stockinette (k all RS rows, p all WS rows) for 10 inches, or until length of work is equal to length of robe front from hem to about three-quarters of the length of body of the front. Next row [RS]: [K2tog] across. 63 sts. Work in stockinette (K all RS rows, p all WS rows) until piece is equal to length of front from hem to safety pin. Work shoulder shaping as for front. Soak and gently block all pieces. Sew front of robe to back, leaving gaps near the top to create armholes. Sew the shoulder straps together. Weave in ends. Knit a length of Edging A sufficient to trim the lower edge of the robe. Knit two lengths of Edging B sufficient to reach from the lower edge of front seams of the robe, over the shoulder, to the lower edge of the back of the armhole. Sew Edging A to the hem of the robe. Sew one strip of Edging B to each seam line from the hem, along the shoulder strap, and down to the lower edge of the armhole. Crochet two 20-inch lengths of chain. Run these through the holes at the neckline and the waist; tie in back. Using smaller needles, CO 11 sts. Row 1: S1 1 as if to p wyib, [k1, p1] to end. Rep Row 1 until work measures 1.5 inches. Rep Row 1 until work measures 6.5 inches. Sew one long edge of Back/Side strip to one long and two short edges of the Crown, easing in fullness as you go. Row 2: Sl 1, work next 3 sts as Looped Knitting, k1. Repeat these two rows until you have worked a strip that will run completely around the outer edges of the assembled bonnet–front, sides and back. Beginning at center back, sew looped edging to outer edge of RS of bonnet. See photos as a guide. At lower corners of front opening, sew two lengths of ribbons to serve as ties. Using smaller needles, CO 66 sts. Repeat Rows 1–5 44 times – there will be 23 raised and 22 depressed stripes. Though the fabric is reversible, the RS will be that which begins and ends with a raised stripe. Using smaller needles, CO 161 sts. Row 6 [RS]: K7, [SKP, yo, k2tog, k7] to end. 147 sts. Soak and gently block all pieces. Weave in ends. Sew lower edge to center, spreading out the center ridges as you work to create a smooth seam. Knit a sufficient quantity of Edging A to trim the sides and lower edge of the robe, making sure edging will turn corners neatly, without curling. Sew long strip of edging from upper right corner of cloak, around the perimeter to the upper left corner. Take care to ease the edging at the corners and avoid curling. 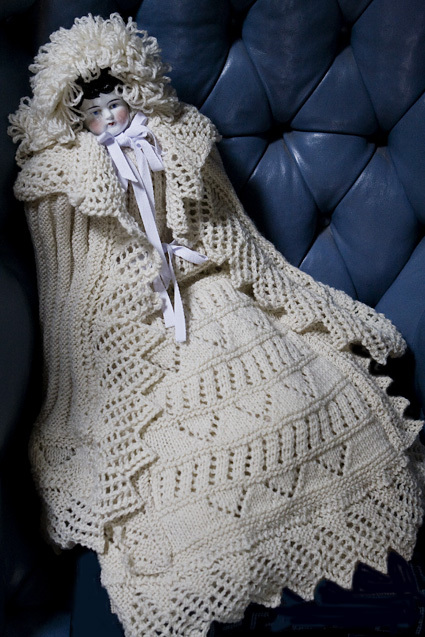 Run a length of yarn through the upper edge of the cloak and gently gather the ridges together. Weave in gathering yarn on each edge to secure. Knit a second length of Edging A sufficient to trim the gathered upper edge of the cloak center. Sew short strip of edging along RS of upper edge of cloak. Sew equal lengths of ribbon to upper corners of robe to serve as neck ties. 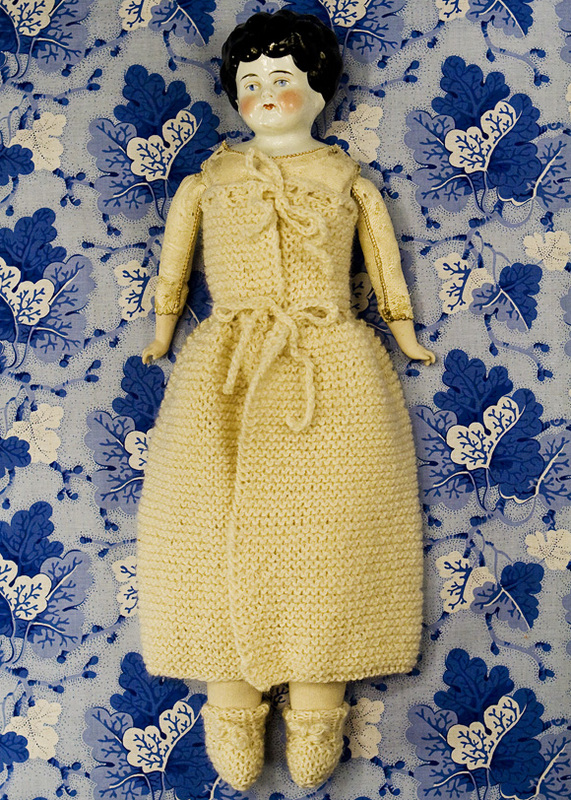 Sew two more lengths to right and left edges of robe, approximately at position of doll’s waist, to serve as front closures, using photos as a guide. Franklin Habit is the Chicago-based proprietor of the popular knitting blog The Panopticon and author of It Itches: A Stash of Knitting Cartoons (Interweave Press). 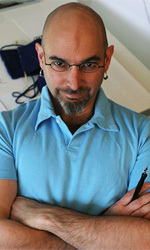 He teaches and lectures on a variety of knitting topics, across the United States and internationally. 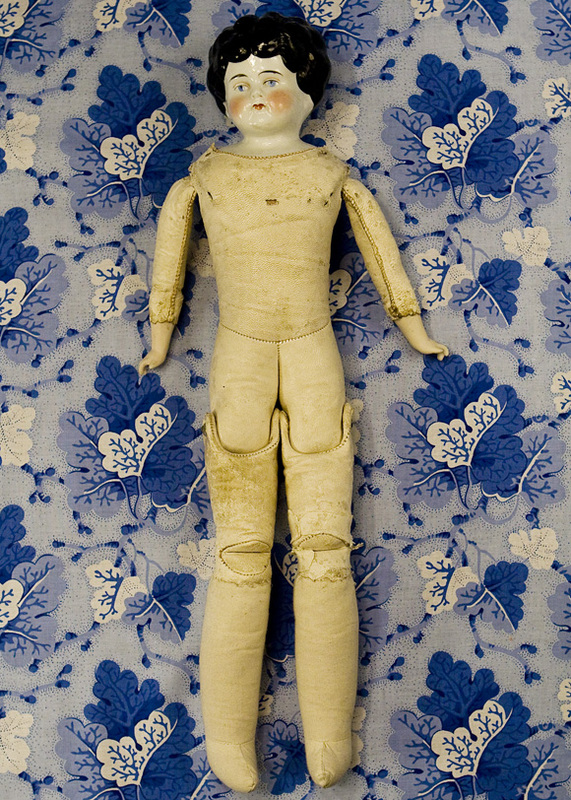 His dolls are home-schooled, so that they run no risk of mixing with Barbies and picking up horrid accents. Pattern & images © 2011. Franklin Habit.